I am currently developing another module titled The Heart of Fire. In a style that seems to be somewhat typical of me, it's another big one - 116 pages at current count - but I think this module might actually be more usable because of the way it's designed. It's not a linear path... It's effectively a dungeon crawl where the players can take multiple paths to their primary objective, or deviate to do something that has nothing to do with the primary objective, or just wander around and kill stuff. There are several roleplaying options, lots of traps and lots of monsters. Should be fun! The module is about 90% done, and all that remains is the design of three different rooms and for me to write a whole lot of fluff for the rest of the module (as I've said many a time before, I'm no good at fluff). Recently, as part of the "RPG chat" that occurs every Thursday, the discussion came up about how one goes about creating a campaign. A lot of people mentioned how they have a hard time with the "nitty gritty", putting together the mechanics on how things work, and have a much better time just coming up with stories or descriptions of things. I am the complete opposite: I guess it's because I've been a computer programmer for thirty years, but I have a tendency to do all the mechanics first and foremost, and then fill in the blanks and make the story around that. Case in point: in The Heart of Fire, the first thing I designed was the full stat block and tactical encounter map for the endgame boss. I had no idea what his motivations were, or why he was a "boss" in the first place for that matter. I had no clue what environment he would be in, or what would be involved along the way in order to get to where he is at. In the module there is currently a group of zealots known as the Blackfire Order that worship said boss, but at the time I created the boss' stat block that cult didn't even exist; I hadn't thought of it at all. I had a fully documented Level 12 Solo Controller with an arsenal of traps and devices around his lair, but I didn't quite know what to do with it. Everything leading up that didn't exist, and at the time I had no clue what it would be. Over time I built a world around it, but I built it one stone at a time. Whereas some people may have a vision of the story from beginning to end in their head, I didn't have the faintest idea where it would go. Eventually I created the Blackfire Order (the aforementioned zealots), and another group of antagonists that get in the way, and the maze of tunnels inside the volcano that the boss calls home, and the island on which the volcano stands, and the small fishing village at the opposite end of the island where the encounter starts. Actually, I didn't even get that far yet: the page on which I am meant to describe Serpent's Cove - the village where the party begins their adventure - is completely blank. I haven't written a thing about it. But every creature, trap and hazard has a stat block. I know exactly how much XP every room has, and I know exactly what level the PCs will be if they take certain paths. I have 36 encounter areas with detailed mechanics, ranging from every unique monster's stat block to the hit points and defenses of the average temple door... but every single one of them has a "read aloud" section that currently blank. At the time I didn't know what to do with it, or where it was going to go, or what's in it. Now I have a vague idea, but still nothing concrete. But like I said above, I know every mechanical detail about the encounter that's just outside the door to the North (7 monsters, EL 11, 2,950 XP) and the specifics on the trap that secures the door... but that's it. All in all, a neat little map... That's devoid of content. So I leave this to you: using the map above, design what the contents of the room will be. Put in as many death traps as you want, pile it full of enough monsters so that they can't move, devise some sinister puzzle or contraption that makes it difficult to get so much as a coin out of this place. 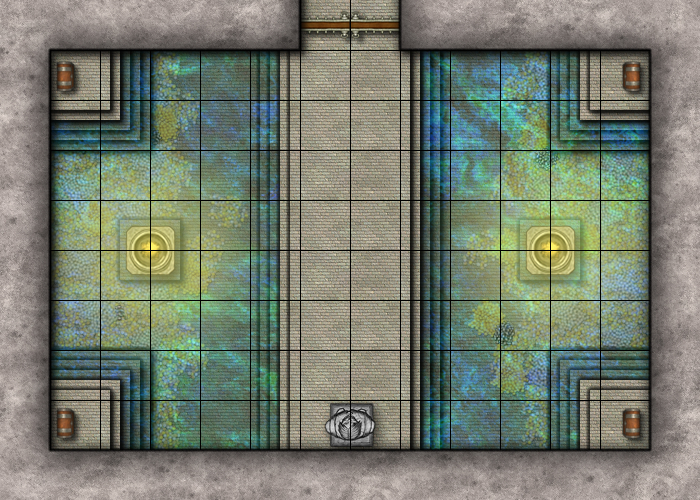 The room could be a real treasure vault, or a place of watery doom. Use your imagination! Conditions: The only condition is that you do not alter the structural content of the room. You can add all the creatures you want, but you must not change the appearance of the room by adding objects. At least not initially, that is - objects might appear after the room is interacted with, such as things popping out from the walls, rising out of the ground, or simply appearing out of thin air - but when the players enter the room must be as it appears above. Again, monsters are the exception: put whatever you want. Game System: The design could be of any level, and preferably for D&D 4e although I will accept other game systems with D&D mechanics (from 1st Ed D&D to Pathfinder). You can even "fourthcore" it, if you're so inclined. Judging: Depending on how many entries we get, I will either judge them myself or find judges to take a look. We'll see. Prize: These days I cannot guarantee retail prizes like I've done before as I don't have the resources to buy them, but I could guarantee prizes I myself have created since they're free to me. And, to be honest, if your design knocks my socks off maybe we can work something out to include part of all of it in The Heart of Fire. Of course, you will get credit for the creation in every way possible. No guarantees, but I like to keep my options open. Deadline: All entries must be in by midnight December 18th, 2011. So if you're up to it, show the world what you can do! I guess it would help to add the email: send it to contest@brainclouds.net!